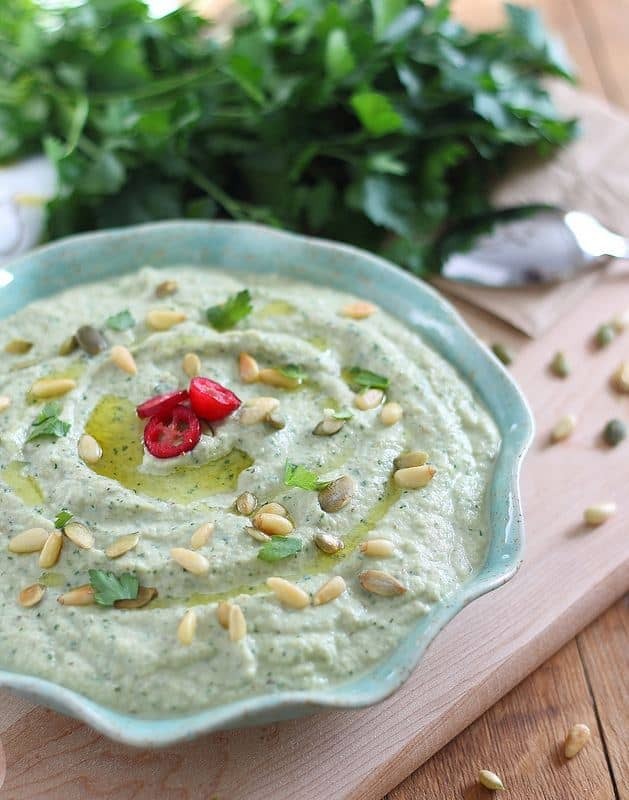 This creamy roasted eggplant dip is perfect for parties or healthy snacking. Let’s kick off 2013 with some eggplant. Not your favorite thing to ring in the New Year with? Well, it beats how I almost literally spent the first few seconds of this year which was being persuaded (unsuccessfully, however) to kiss an 8 year old Yorkshire Terrier since I was the only one in the house without a significant other to smooch come midnight. I don’t do dog kisses though and for those of you that do, I urge you to reconsider and just take 2 seconds to think about where those tongues go. Got that mental image? Good. Now make that your New Year’s resolution. Bet eggplant sounds even more appetizing now. Ok forget about dog tongues and where they go and think about roasted eggplant, roasted garlic, lots of parsley and some yogurt, tahini and lemon. It’s a savory smooth dip that packs a tangy punch. Copious amounts were consumed on pita bread triangles on New Year’s eve and I mentally resolved, while shoving something like the 23rd piece of pita bread in my face, that I’m going to buy a weekly eggplant from here on out so this gets made more often. I can foresee slathering it on everything from roasted veggies to using it in a chicken salad in addition to it’s excellent dip-ability. I don’t think I’ve ever done a real resolution but a weekly eggplant purchase seems like one I can handle. Wash eggplant and poke holes with a knife all around exterior. Place on a baking sheet. Wrap garlic cloves in aluminum foil and place on sheet with eggplant. Roast for 35-40 minutes until the eggplant is browned and soft. Flip once in the middle of roasting. Remove eggplant from oven and slice in half lengthwise. Scoop flesh out of the skin and place in a food processor. Squeeze roasted garlic out of it's skin and into the food processor as well. Add remaining ingredients except olive oil to the food processor and process for about 30 seconds until combined. Drizzle olive oil into the food processor while running and process for about another minute until smooth. Season to taste with more salt & pepper if needed. I am not an eggplant person, but what a great use of one!! If I get one in my CSA box I am for sure going to make this dip! It sounds incredible! By the way, I’m with with dog kisses! I have two dogs and the one uses his tongue like a snack and the other one stop licking, she’ll even lick your jeans, so weird! I fully support your resolution to buy eggplant each week and share delicious yummy-looking recipes with all of us, like this one. I love eggplant! I love finding ways to use it so even my husband will eat it. I also like saying aubergine, because it sounds cool. Also, I’m with you on dog kisses. I’m glad my dog doesn’t lick anyone’s faces. He’s respectable like that. This sounds great. I already roast and freeze my garlic crop when it’s ripe in June, and now I’m thinking instead of grilling slices of eggplant when I get it in the farm share, I’ll roast a few to have on hand for this dip. I resolve to add more avocado to my life. this recipe is very Greek of you, love it! I know where my puppy tongues go, and I still kiss them. But only my dogs, not other ones (does that make me even slightly less gross of a human? probably not…) My husband loooooooves it ;) This dip looks delicious Gina! I have an eggplant at home and the urge to use my vitamix tonight… Totally trying this!!! Using it in chicken salad literally made me start drooling like a maniac. SOUNDS SO GOOD! ps- Travis is taking great offense to the comments above and is currently sulking in the corner of his crate. Love love love eggplant! 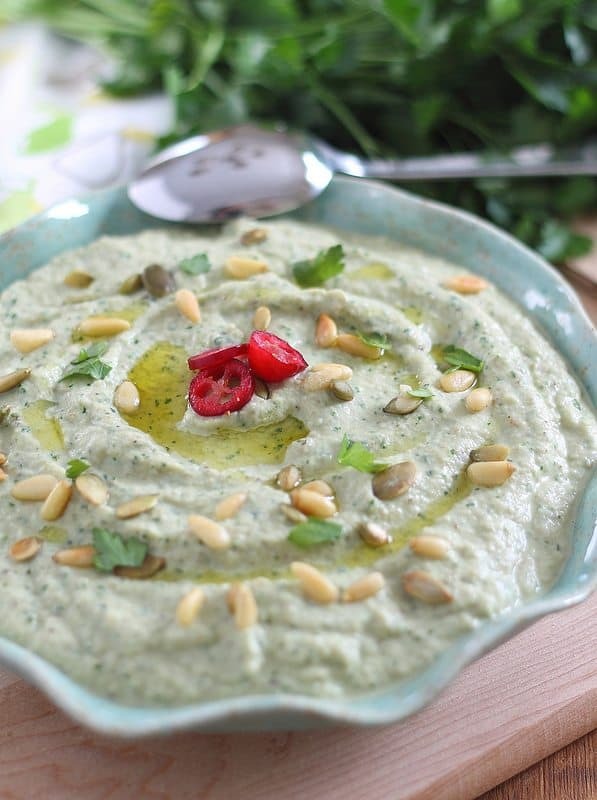 I will make this dip and then serve it with baked eggplant “chips” – lol! A double whammy of eggplant sounds delicious to me! Gina, this looks absolutely, heartbreakingly, gorgeous! This sounds like a very delicious way to start the new year! 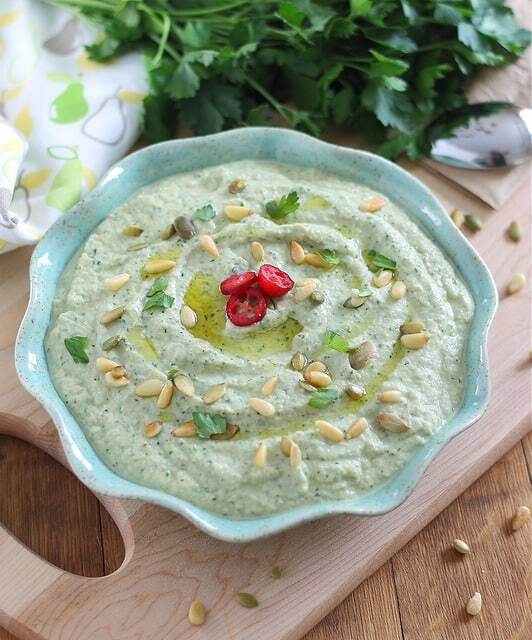 We love eggplant in our house… never thought to transform it into dip! Totally making this soon! I can even bet that when I serve it at a football party, they guys won’t know it is healthy!